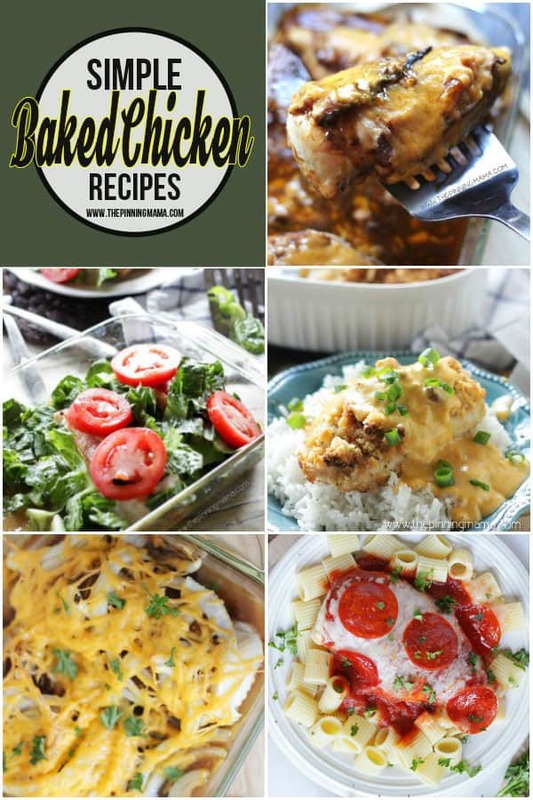 If you are looking for easy and delicious dinner ideas, these baked chicken recipes have you covered. 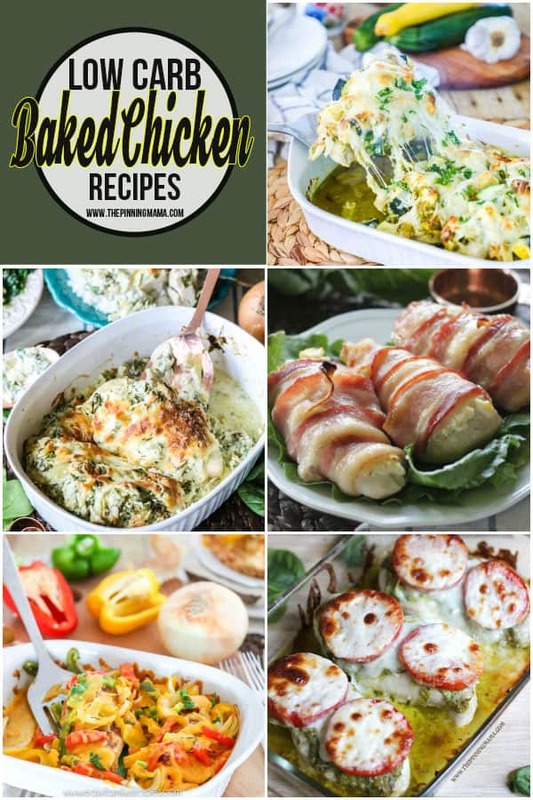 With everything from basic baked chicken to Italian baked chicken, Mexican inspired baked chicken dishes, to healthy baked chicken recipes, and from boneless chicken breasts to cooking a full chicken in the oven, this list has every baked chicken recipe that you could ever need! Baked Chicken can make so many different types dinners and can be a quick, easy and wholesome way to prepare a meal. Chicken is one of the best meats to cook meals with. It is lean, tender and works well in almost any type of cuisine. 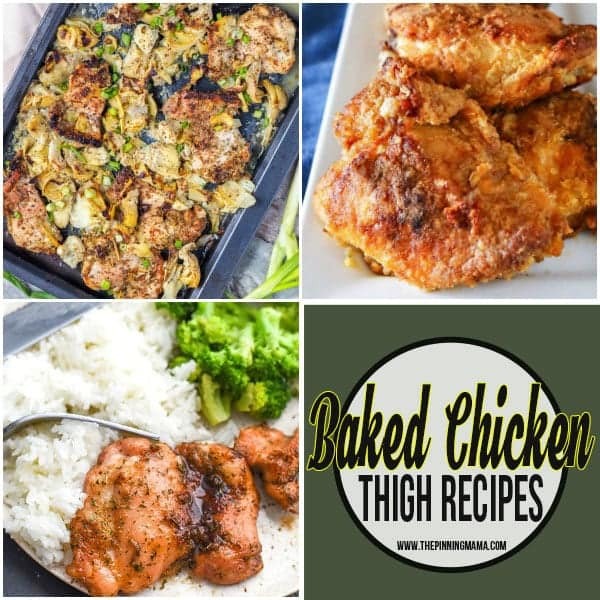 I make A LOT of chicken recipes that I share here on my blog, and one of the things I love most about baked chicken recipes are that they are so easy to prepare. Many of them can be made in just one dish so not only are they easy to make, but also to clean up. Baked chicken can be used in many dishes like these shredded chicken recipes, or can be an entire meal in themselves loaded with veggies and delicious flavors. 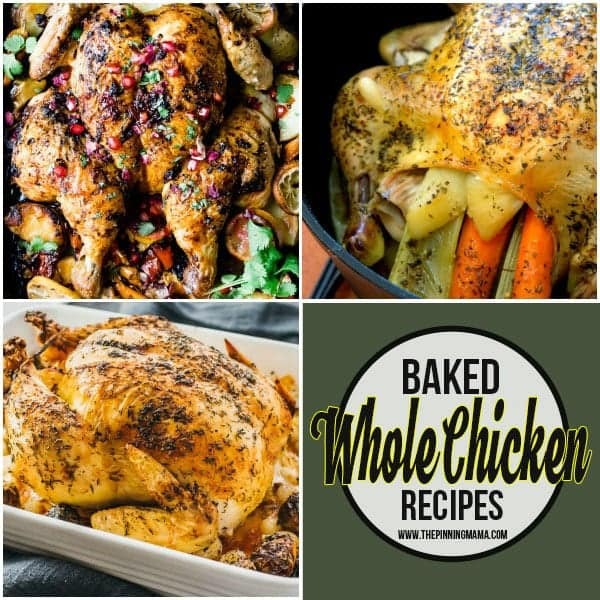 Check out the baked chicken ideas below for meal ideas, or skip down to the bottom for an easy baked chicken recipe you can use for chopping, shredding, adding to salads, pizza, pasta, or meal prep. You can also see my Weekly Meal Plan here to see what’s on the menu this week! My personal favorite cut of chicken is boneless, skinless chicken breasts. Most of the baked chicken recipes that I make use chicken breast since it is easy to work with, lean and wholesome, and are tender and delicious. However, any type of chicken can be prepared in the oven. You can bake, chicken breast, both boneless, skinless, and bone in, chicken thighs, legs, or wings, and even whole chickens. You can also substitute cuts if you have a recipe you love but would rather use chicken breast instead of chicken thighs, or vica versa. The cooking time may change if you do change the cut. How do you bake chicken in the oven? Baking chicken in the oven can be as simple as seasoning the chicken and placing it on a baking sheet, or can incorporate a full meal by adding additional seasonings, flavors, meat, veggies, and cheeses. The temperature that you will bake chicken at in the oven will vary by cut and recipe. Most recipes will call for a temperature between 350˚F- 425˚F. A thicker cut will generally be on the lower side and a cut that you want to get nice and crispy like wings, thighs, or other chicken baked with the skin on is generally higher. To be safe to eat, chicken needs to have an internal temperature of 165˚F. Depending on the cut of meat you are using, how thick the piece is, whether or not it is boneless, and how many other ingredients are in the dish with the chicken will determine time and temperature to bake the chicken at. Each recipe will detail a guideline on what temperature and how long to bake the chicken to reach the proper temperature, but again the only way to be 100% sure is by using a meat thermometer. Although I can vouch that all of the recipes on this list are delicious, I wanted to pull out a few of my favorite baked chicken recipes to put here at the top. Not only are these my personal favorites, and really crazy delicious in my personal opinion, but all of these are tried and true recipes that thousands of people have made and loved over the years. You can also find more baked chicken recipes by cuisine type below and cut of meat below these. Since baked chicken is so versatile, there is little you will find that it doesn’t go well with. Since I listed my favorite baked chicken recipes for you though, there are some extra delicious sides that also rank among my favorites that you might want to try like garlic smashed potatoes, sautéed green beans, Mexican cornbread, and these mashed potatoes made with cream cheese! 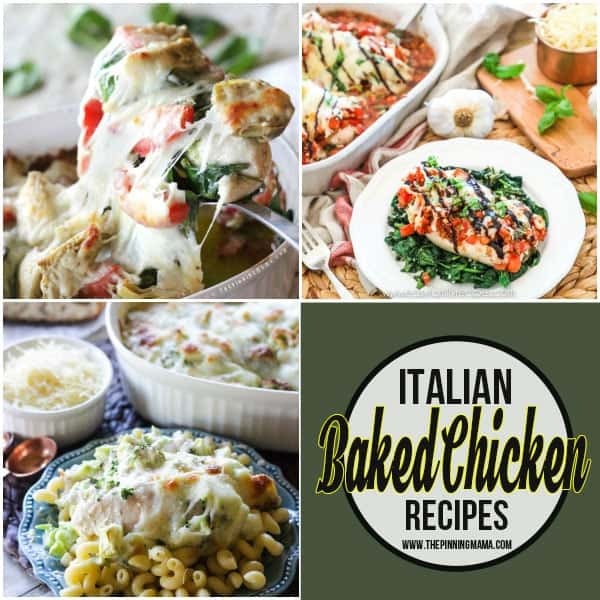 These baked chicken recipes bring in all of the great Italian flavors you love into an easy baked chicken meal. From pesto to balsamic to bruschetta tomatoes, they only get tastier when paired with tender chicken. Italian flavors are some of my favorite both for the flavors themselves, and for the delicious side dishes that go along with them. 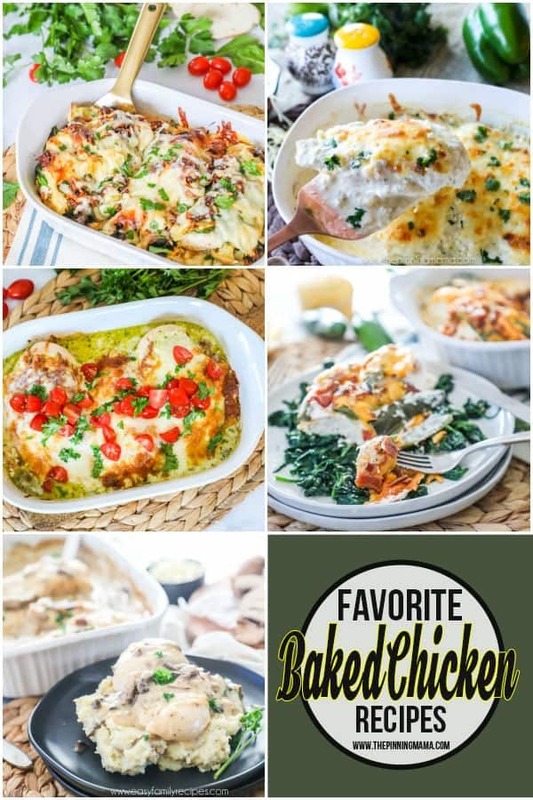 Some great serving ideas for theses Italian themed baked chicken recipes are pasta tossed with olive oil and garlic, tomato sauce, or pesto, mashed potatoes, sautéed spinach or other greens, a side salad, balsamic roasted veggies, and of course garlic bread! Being born and raised in Texas, I need to have some tex-mex in my life at least once a week. 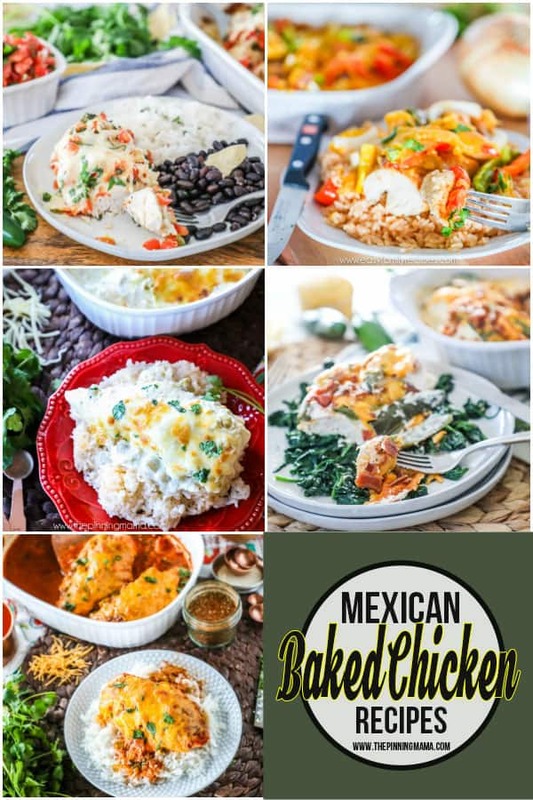 Baked chicken meals take the flavors from your Mexcian favorites and make them into a super easy, and many times much lighter Mexican style baked chicken meal. As a bonus, many of these work really well for doubling and then using the leftovers to make additional meals throughout the week (or month if you freeze.) . You can shred or chop the leftover chicken and use it to make dishes such as tacos, quesadillas, salads, burrito bowls, nachos, etc. These Mexican flavored baked chicken dishes would go well served with traditional Mexican sides like Spanish rice, low carb Mexican cauliflower rice, black, pinto, or refried beans, Mexican style street corn, tortillas, Mexican cornbread, or any type of roasted veggies. These baked chicken recipes have some of the most classic flavors in them. From barbecue, to bacon, broccoli and cheese, pizza, and even sloppy joe style, it is amazing how your favorite dishes can be made into an easy chicken dinner. Since these recipes give you a wide variety of flavor options, serving ideas can vary, but almost all of them would go well with my favorite mashed potatoes, your choice of pasta, broccoli, smashed potatoes, garlic toast or salad. Making a whole chicken in the oven is an easy way to prepare a beautiful meal. While the result of a roasted chicken is certainly stunning, the process is easy so it makes a perfect family meal. Chickens can be roasted whole, or split in half to reduce the baking time. Find some top recipes for baked whole chicken below, from classic to more exotic seasonings. Roasted chicken can go great with so many things for serving. We usually prefer classics like mashed potatoes, roasted cauliflower, one pot mac and cheese, sautéed green beans, brown sugar carrots, or salad. If you are looking to make a whole meal in one dish, these baked chicken and rice dishes are a great way to do it! The chicken bakes right in with the rice and even veggies, so you get your main dish and your sides all in one! These are quick and easy to make, plus quick and easy to clean up since it is all baked in one dish. Also, the leftovers reheat really well if you want to pack them up for lunch or later in the week. Baked chicken is a great meat option when you are following a low carb diet. All cuts of chicken are low carb, however recipes made with chicken breast and chicken thighs are especially popular on the diet. You can serve these recipes with low carb side options such as roasted cauliflower, sautéed green beans, side salad, cauliflower rice, broccoli, brussel sprouts, or other healthy options. Baked chicken thighs are generally juicy and delicious and often include the crispy skin. You can find recipes for both chicken thighs with the bone in, or boneless chicken thighs based on your preference. Chicken thighs taste great with a variety of flavors, so you should be able to find something that matches your taste preferences! Baked chicken thighs go great with a variety of sides. I love to serve them with broccoli slaw, roasted cauliflower, Instant Pot mashed potatoes, or these delicious garlic smashed potatoes, and garlic bread. I hope this list was helpful and you got packed up for new ideas for your weekly menu! If you have a favorite recipe for baked chicken that I missed or a great serving suggestion, please let me know in the comments. I would love to check it out!